Rwanda dubbed the land of thousand hills is the best hiking destination for tourists searching for hiking destinations in Africa. The famous Karisimbi Mountain is one of the mountains in Rwanda where tourists on their safaris to Rwanda can easily enjoy memorable hiking experience while on their holiday safaris and tours to Rwanda. 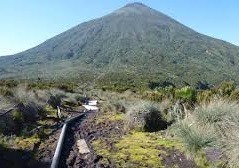 Mountain Karisimbi is the highest volcano among the eight volcanoes that form the precious Virunga massifs which are shared between three neighboring states of Rwanda –land of thousand hills, Uganda- the pearl of Africa and the nature richest Democratic Republic of Congo. The volcano’s highest peak stands at an elevation of 4507m above sea level and this makes it to qualify to be the fifth highest mountain in Africa. Hiking to the top of the volcano is hectic but ones who hikes on Rwanda safaris reaches the top he/she is highly rewarded with the wonderful views of the natural surroundings of Rwanda, Congo and even parts of Uganda. Mountain Karisimbi was named after the indigenous Kinyarwanda word ‘amasimbi” which directly means “white shell”, representing the white-capped top of the Karisimbi volcano. The popular mountain is surrounded by other Virunga Volcanoes namely Mikeno volcanoes located on the northern parts and Mountain Bisoke on the eastern direction, Nyiragongo Volcanoes –an active volcano which erupts after each and every two years on the west direction. Karisimbi Mountain-the highest Valocanoes among the eight Volcanoes is strategically positioned in the areas covered by Volcanoes National Park and this offers it an opportunity to be hiked by visitors on their mountain gorilla trekking safaris to Rwanda. Hiking to the top of mountain Karisimbi takes visitors on hiking safari tour to Rwanda about 2 days and the hike which starts at 6:00am local time takes hikers through other sister Volcanoe-Bisoke Mountain before trekkers access the first camping area where trekkers rest before advancing with the marvelous hike to the peak of the Volcano. Hiking Karisimbi Volcano does not only reward hikers on their hiking Safari tour to Rwanda with the sights and view of different unique bird species but it also gives hikers a close account to different primate species housed in Volcanoes national park where Karisimbi is located. Hiking Karisimbi Mountain requires hikers who are physically fit because the hiking trails used by tourist when accessing to the peak of the mountain are very slippery, muddy and hence unfavorable for unfit visitors. In addition to fitness, one needs to hire porter to help him/her to carry the equipment and some other Luggage.